Colorful sequin swarms of the popular bodice that is scoop neckline and sleeveless style. The ivory tulle skirt is sheer and looks ethereal that adds more fairy tale feel to the whole dress. The navy blue sash is detachable that can be tied in any types as you desired. Modern bodice and elegant skirt that are beautifully compatible for this stunning wedding little baby girl dress. The sequins ivory tulle wedding little girl dress is fully lined and hidden zipper closure. This unique dress style is perfect for Gatsby themed wedding, just imagine how beautiful your little princess in this style to flaunt their special day. Category: Flower Girl Dresses. Tags: detachable sash, ivory tulle, scoop neckline, sequins, sleeveless. Colorful sequin swarms of the popular bodice that is scoop neckline and sleeveless style. The ivory tulle skirt is sheer and looks ethereal that adds more fairy tale feel to the whole dress. The navy blue sash is detachable that can be tied in any types as you desired. Modern bodice and elegant skirt that are beautifully compatible for this stunning wedding little baby girl dress. The whole dress is fully lined and hidden zipper closure. This unique dress style is perfect for Gatsby themed wedding, just imagine how beautiful your little princess in this style to flaunt their special day. 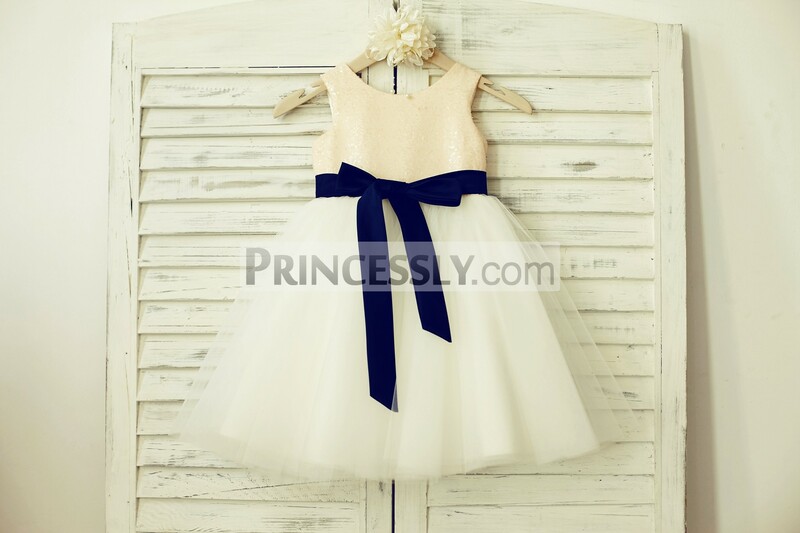 Be the first to review “Mint Sequin Ivory Tulle Flower Girl Dress with Navy Blue Sash” Click here to cancel reply.